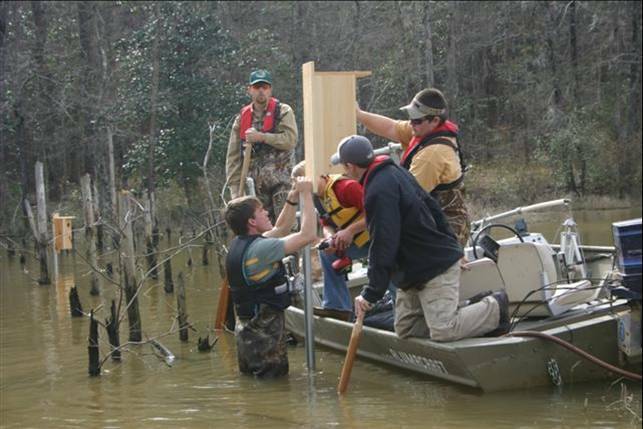 There are a number of federally listed mussel species for which streams on Fort Rucker provide suitable habitat. The southern sandshell, southern kidneyshell, Choctaw bean, tapered pigtoe, and fuzzy pigtoe occur in the Choctawhatchee watershed, of which Claybank Creek and Steephead Creek on the Installation are part. The Choctaw bean and fuzzy pigtoe have been recorded on Fort Rucker in recent invertebrate surveys. However, the other species have not been found in any recent surveys. Also, the Gopher tortoise is a Species of Concern and is located on the installation. Training Requirements Integration (TRI) - optimization of land use by integrating mission requirements with the carrying capacity of the land. Fort Rucker has many good hunting opportunities. For more details consult Fort Rucker Regulation 215-1 (above), DPW-ENRD Natural Resources Branch at 255-9368/2416, or Range Operations at 255-4837.